Perhaps it is unfair to critique this article, since it came out almost immediately after the preliminary report on WTC 7, without the benefit of the subsequent expert examination of -- and scientific queries about -- that report. But because this is another example of PM's slavish acceptance of the official story, and its refusal to consider countervailing evidence, and because here and now in 2011 people are still quoting this article to me, I think it's appropriate to offer a critique, the text of which is in bold green. There are many, many more critiques of the WTC 7 report -- preliminary and final -- on the web. GAITHERSBURG, Maryland -- Shyam Sunder, the lead investigator on the National Institute of Standards and Technology (NIST) report, responded directly to many conspiracy claims here this morning at his press conference in NIST headquarters in Gaithersburg, Md., which was attended by mainstream media and a handful of conspiracy theorist media, including a representative from InfoWars.com, a Web site that puts forward 9/11 conspiracy theories. Sunder specifically addressed conspiracy claims linked to WTC 7. "Before I tell you what we found, I'd like to tell you what we did not find," Sunder told reporters. "We did not find any evidence that explosives were used to bring the building down. The collapse was also not due to fires from the substantial amount of diesel fuel stored in the buildings." A: "What about that letter where NIST said it didn't look for explosives?" N: "Right, because there was no evidence of that." A: "But how can you know there's no evidence if you don't look for it first?" N: "If you're looking for something that isn't there, you're wasting your time... and the taxpayers' money." It should also be noted here that the only press conference attendee mentioned by PM was Alex Jones's InfoWars.com. Jones has done much to open up the 9/11 issue to the public, but he also covers many other issues which, if readers were to go to the site, they might find far out or offensive. PM neglected to mention the scientists and engineers from Architects and Engineers for 9/11 Truth (http://ae911truth.org/) and Scholars for 9/11 Truth and Justice (http://stj911.org/) who provide the scientific critiques of NIST's report. It is characteristic of PM's approach (and that of others who construct such "hit-pieces") to do everything they can to discredit the 9/11 Truth movement without resorting to serious examination of the evidence. Claim : "No combination of debris damage, fuel-tank explosions and fires could inflict the kind of simultaneous damage to all the building's columns required to make the building implode," says WTC7.net, a Web site dedicated to conspiracy theories. "The precision of such damage required to bring Building 7 down into its footprint was especially great, given the ratio of its height to its width and depth." It is odd that Sunder mentioned loss of strength and stiffness and then goes on to imply that didn't play a role in his scenario. It almost seems an attempt to raise a confusing, irrelevant issue. It is also odd that he refers to weakening throughout the building, when fire was confined to sporadic moving-and-dying-out fires on floors 7-14 of a 47-story building. But there are two more-serious problems here. One is the fact that the connections between structural elements tend to be stronger than the elements themselves, yet Sunder says they failed before the elements did. However, a more fundamental problem is one of apparent scientific fraud relating to the collapse of Column 79, the column NIST claims initiated the failure -- the linchpin of NIST's "thermal expansion" argument. 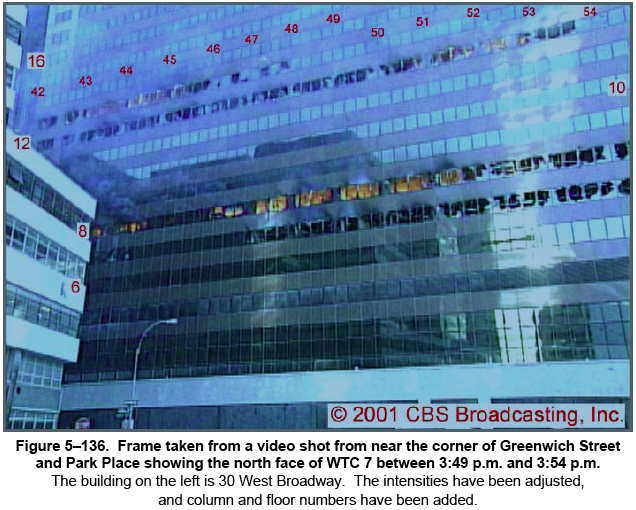 NIST claims that heat caused the floor beams supporting the 13th floor near Column 79 to expand sufficiently to push the girder on which the beams were resting off its connection to Column 79, so that the floor fell, pancaking the floors below and robbing the column of support until it collapsed and fell, causing adjacent columns to fall. Unfortunately for this conclusion, WTC 7's blueprints indicate that those beams were locked into the concrete-and-steel floor decking by the use of many shear studs. This floor decking wouldn't have expanded to the extent and at the speed NIST claims the steel beams did, and thus would have prevented the beams from doing so. So how could NIST claim the beams expanded? They simply omitted the shear studs from their model. This can hardly be considered accidental, in a model that allegedly modeled every element and connection in the building. The earlier diagrams show fire spreading out from the lower right along the east (right) and south (bottom) edges, but never reaching the north side. Yet the photo shows that fires had actually been there, and then gone out. They burned out long before the building collapsed, and could not have contributed to any "thermal expansion" in the area. As to that inferno heat shown on the east side, remember, there's no photographic evidence for it. It appears to have been inserted into the model to make a case for thermal expansion that otherwise couldn't have happened. In addition, people familiar with the floor layouts (rooms, etc.) in WTC7 have pointed out that NIST's description of the floor layouts in many cases bears little resemblance to the actual floors, and their estimates of combustible loading (the amount of burnables) are likewise frequently inconsistent with the actual reality. Finally, NIST appears to have ignored the common parameter that office fires tend to burn out in any area in about 20 minutes, moving on to adjacent areas where possible, leaving little time for major heating of beams or other elements that are part of a huge network of heat-dispersing steel. All of this further calls into question NIST's description of the fires. But again, the failure to acknowledge the presence of shear studs makes all of this moot, since their presence would have prevented -- regardless of the fires -- the free expansion of the floor beams on which NIST's scenario totally depends. The building wouldn't have collapsed from fire even if the fires had been exactly as NIST described. Claim : The shape of the building's tidy pile of wreckage is consistent with a demolition, conspiracy theorists say. PM apparently didn't look at NIST's report sufficiently to see these crushed-beer-can pictures. Anyone who watches the videos (taken from the north and northwest) of the collapsing building's exterior sees what looks like a perfectly rectangular box being sucked into the ground. The discrepancy between that and NIST's crushed beer can is so great that one is tempted to think NIST hoped no one would actually look at their report. But maybe this is just a glitch in the model or illustration? It doesn't matter. High-school physics teacher David Chandler used free high-school physics software to calculate the acceleration of WTC 7's roofline as the building collapsed. For a period of a little over 2 seconds during the start of the collapse -- 10 floors worth -- it fell at free-fall acceleration. In the preliminary report (which, in fairness to PM, is what PM would have seen if it had looked at it), NIST used inappropriate beginning and ending points for their calculation and claimed the collapse was much slower than free-fall. Faced with the obvious proof of free-fall, NIST eventually back-pedaled and admitted to free-fall in the final report. But free-fall means that nothing (no intact structure) was present beneath the upper part of the building to slow it down. Ironically, Sunder had made precisely that point in his initial comments, saying that that is why free-fall couldn't have happened -- i.e., it was inconsistent with their model. The fraud is manifest in the fact that, even though NIST eventually admitted free-fall, it nevertheless left its model's conclusions intact, despite the fact that free-fall's having occurred made those conclusions physically impossible. Experienced physicist Steven Jones had already by this time found chips of unreacted nanoscale thermite scattered throughout all his dust samples. In addition, he (and other professional analysts) had found massive quantities of iron/aluminum microspheres in the dust, which could only have been created by molten iron blasted into an aerosol -- a situation typical of thermitic reactions and not of office fires. Nanothermite (developed in Department of Energy labs, not in Afghan caves) reacts instantly, and, in a "sol-gel" suspension, explosively, but not as loud as TNT or C4. As a final nail in the coffin, a hydrocarbon characteristic of that sol-gel was found in inexplicably large quantities by the EPA, which had never seen it in fire wreckage before. The point here is that NIST could not have missed the nanothermite chips or the microspheres if they had looked for them, as is legally required in the standards set forth for fire investigations where there is significant structural dismemberment -- standards which explicitly mention thermite. But NIST didn't look for them, because they claimed that getting such materials into the buildings was "unlikely." Likely or not, they were there. As an engineer once pointed out, "We know that there is methane on Jupiter. We don't know how it got there, but that doesn't change the fact that it is there." If you don't look for evidence, you don't find it. Claim : At the press conference, theorists questioned why NIST had just now found a previously undocumented cause of building collapse. The aforementioned (and ignored) shear-pins make this argument completely irrelevant. The similarity to a textbook case of controlled demolition is so obvious to everyone (demolition experts included), that Sunder could only say he knew from the beginning that the task of determining why the building collapsed would be difficult if he knew from the beginning that he was going to ignore the obvious. It took a lot of money, time, political pressure and flagrant dishonesty to do that. Claim : The minimal wreckage available for later investigation has generated speculation. Some conspirators point to the fast removal of debris as evidence of a government coverup. 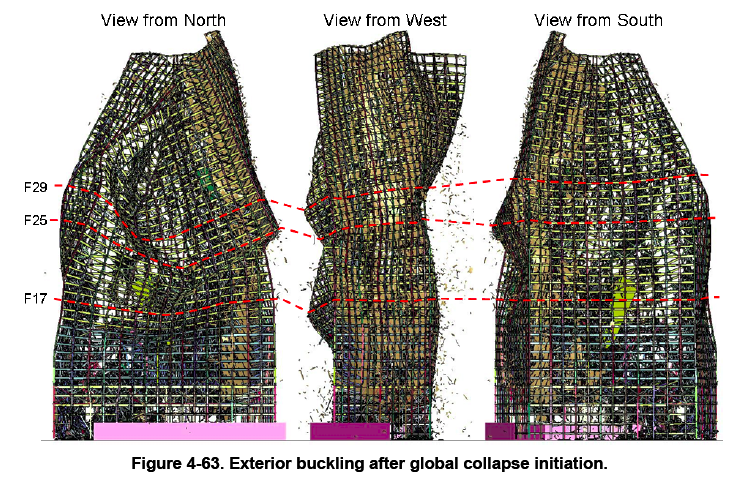 NIST report and press conference: Compared to WTC 1 and 2, NIST had very little WTC 7 wreckage to study. The site was cleared quickly in a search-an- rescue effort, and much of the debris was transported to salvage yards. "There was no loss of life," Sunder noted. "In hindsight, we knew that the building was evacuated. But we didn't know that on that day." Hundreds of investigators at the salvage yards later found that the Twin Towers' steel columns were labeled and numbered, while the columns from Towers 5, 6 and 7 were not. "I am not surprised that there wasn't a lot of identifiable debris," Sunder said. "But at the time, we were concerned about terrorists who attacked our country and search and rescue. I think the fact that they [investigators] didn't collect [wreckage] was the least important activity that happened that day." As to "no loss of life," security official Barry Jennings, who, with the NYC corporation counsel, was caught in WTC 7 when a tremendous explosion utterly destroyed the 5-story lobby at a little after 9 AM (long before either Tower came down), testified that when the fireman who ultimately led them out of the building told him not to look down as they traversed the wrecked lobby, it was obvious to him they were stepping over dead bodies. But more interesting is the fact that the fire department had pulled all its people out of the building and given up fighting the fires hours before the building collapsed. This information was certainly available on the day, contrary to Sunder's claim. Larry Silverstein (WTC7 owner and WTC lease holder) claimed that he and the fire chief decided to "pull" the building to avoid further loss of life. "Pull" means to run a controlled demolition, in spite of Silverstein's later claims that he meant "pull out the firemen," who had, in fact, been out for hours. Avoiding loss of life by demolishing a building implies knowledge that it has been evacuated. As to the debris being analytically worthless because it had not been labeled (why not? ), a demolition would have left massive amounts of evidence in the debris, whether that debris was labeled or not. But because Sunder wasn't about to consider demolition, he feels he can dismiss the destruction of "unlabeled" evidence as irrelevant, even though it is an unprecedentedly gross violation of fire-investigation rules. Unfortunately for his case, one of the few pieces of WTC7 structural steel that was saved, and reported on by the earlier FEMA report, was a piece with holes vaporized in it. Other parts of it were melted razor thin, with sulfur (the thermate accelerant) involved in the melting. This sulfur did not come from gypsum wallboard, as often claimed in hit-pieces. The scientists who wrote the FEMA report, who obviously knew about wallboard, said the presence of sulfur in the melted metal was inexplicable, as was the melting itself and the vaporization. No source of such high temperatures was obvious, and FEMA -- saying its only explanation had a low probability of having happened -- explicitly left it to NIST to figure out what happened. And NIST dodged it carefully and completely. Claim : Many theorists have suggested that the long delay in an explanatory report is further proof of a government coverup. "We had computer programs that took six to eight months to get a correct run" is a very telling statement -- particularly when you understand that NIST tried several sets of parameters to try to get the building to fall, and didn't stop changing them until it "fell." Hardly a scientific approach. Given that Sunder was just quoted as having said that NIST knew from the beginning that the study would be difficult, it's hard to understand why (a) he then "underestimated" the effort, and (b) NIST declined to add investigators to an understaffed operation. But let's not fault him for that kind of incompetence. What he does need to be faulted for is absurdly saying that his conclusions -- see the crumpled building above, so utterly at odds with the videos of the collapse -- "go along with what was observed." And he should be held responsible for the afore-mentioned fraud committed by the omission of the shear studs from the model. It is certainly understandable, given all this, that NIST refuses to permit the scientists involved to discuss the report in public with its critics, though that refusal is highly unscientific. But it is unacceptable, bordering on criminal, that they refuse to release their model's inputs for the usual scientific examination, on the grounds of "public safety." They are leaving construction engineers without the information they need to decide if their long-held building standards are in need of radical revision. So much for public safety. And so much for Popular Mechanics. This article is the equivalent of a newspaper covering a criminal trial, and saying, "The accused didn't do it, because his lawyer stood up in court and said the accused didn't do it." And the failure to release the model's input data for scientific scrutiny is like failing to put that lawyer under oath when he makes the claim.